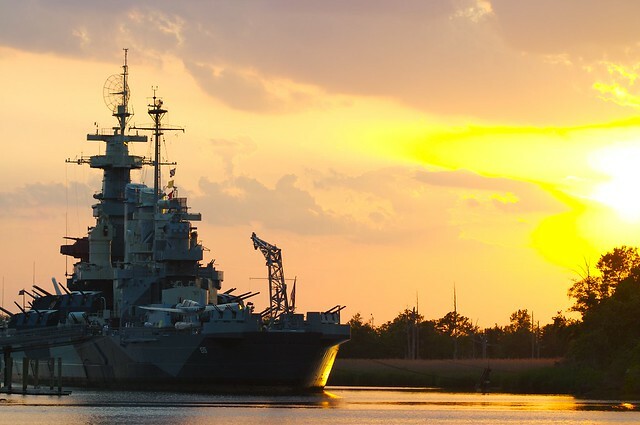 Although today the USS North Carolina floats peacefully in Wilmington, NC, the ship was once at the tip of the US Navy’s spear in the Pacific during World War II. The North Carolina had originally been planned for construction in the 1920’s and her keel was even laid down, however, the approval of the Washington Naval Treaty caused the ship to be scrapped to honor the United States’ treaty commitments. Not until the gradual re-armament of the 1930s was the ship brought back off the drawing board. The ship was finally commissioned on April 9, 1941 and bristled from end to end with nine 16-inch guns, twenty 5-inch dual purpose guns and dozens of 20mm and 40mm anti-aircraft guns. The North Carolina first tasted blood in the Guadalcanal campaign of August 1942 and participated in every major naval offensive of the war. Nicknamed the Showboat, the North Carolina earned 15 battle stars during World War II, survived being torpedoed, sank a Japanese troopship, participated in 9 shore bombardments and downed 24 enemy aircraft. Additionally, the pilots of her Kingfisher aircraft assisted in the rescue of numerous Allied pilots and aircrew and on one occasion Lt. John Burns used his Kingfisher to rescue 10 airmen. Following the war, the North Carolina was placed in the Inactive Reserve Fleet and, after a fundraising effort by North Carolina schoolchildren, was dedicated as a museum ship in 1962. As the most decorated battleship of World War II, the USS North Carolina now serves as a memorial to North Carolina’s World War II service men and women. The ship is open for tours and even hosts an annual 5-K and 1/2 Marathon.